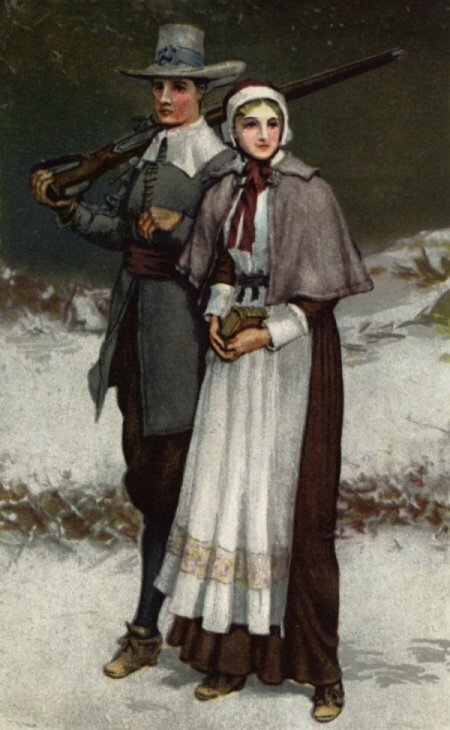 Artistic rendering of John and Priscilla Alden. 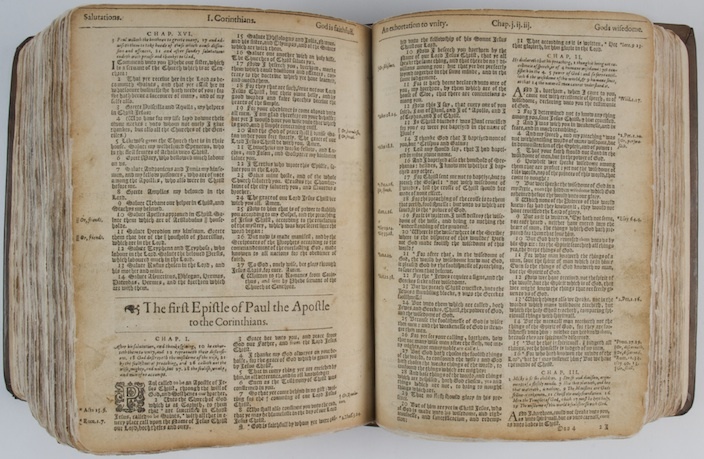 In addition to foodstuffs, weapons, farming supplies, 102 passengers, and two dogs, the Mayflower also carried a copy of the King James Bible belonging to John Alden. In an earlier post, curator Hannibal Hamlin notes that this may have been the first King James Bible to arrive in America. Alden was not a Pilgrim himself; rather, he was a cooper, or barrel-maker, hired by the Pilgrims at Southampton, where the Mayflower was docked before beginning her trans-Atlantic voyage. William Bradford, leader of the Pilgrims, described the 21-year-old Alden as a “hopefull yong man.” Alden may also have been a man of faith, choosing to carry a Bible with him as he journeyed to the New World. Alden’s youth and skill must have impressed Bradford, for the future governor of the colony also noted that the Pilgrims very much wished that Alden would join them, although they left the final decision in his hands. Upon arrival on the shores of Massachusettes in November 1620, Alden opted to stay with the Pilgrims and added his signature to the Mayflower Compact, signed on November 21, 1620. Alden soon had another tie to the Pilgrim settlement. Sometime between 1620 and 1623, he married Priscilla Mullins, a young woman in her late teens or very early 20s. Priscilla had sailed with her parents and older brother Joseph on the Mayflower. However, her parents and brother died soon after their arrival in Massachusetts, leaving Priscilla to fend for herself in the new colony. According to folk tradition, her beauty attracted the attention of Miles Standish, the colony’s military adviser, as well as John Alden, and the two men were deep rivals for her affection. This story prompted Henry Wadsworth Longfellow’s famous poem, The Courtship of Miles Standish. The historical record offers no evidence of a Mullins-Alden-Standish love triangle. However, Priscilla did end up marrying John Alden (the younger man) and over the course of their long marriage, the couple had 10 children, with a possible 11th child dying in infancy. Several of their descendents became notable figures in their own right; their oldest son, John, escaped being tried for witchcraft in Boston, and a daughter, Sarah, married Alexander Standish, son of Miles Standish and his second wife, Barbara. Henry Wadsworth Longfellow was descended from another Alden offspring, and helped immortalize his ancestors through his literary output. This entry was posted on November 20, 2012 by manifoldgreatness. It was filed under Influences, The KJB in History and was tagged with Courtship of Miles Standish, John Alden, Mayflower, Pilgrims, Priscilla Mullins.